You can see from the beautiful front cover of this book that Sandybridge looks an idyllic place to stay. Yet the main character of the book, Grace, has spent much of her life trying to escape the quiet town, studying at Edinburgh Uni, living and working in both New York and London. However, she is back again with her little girl, staying with her mum and wondering how her life is going to work out. 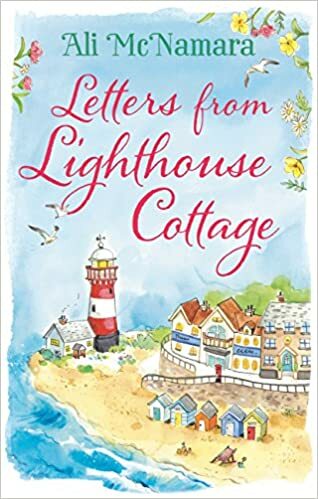 I wasn’t sure what to expect from this book but having read and really enjoyed The Little Flower Shop by the Sea from the same author last year, I was pleased to have the chance to read her latest release. Like that book, there is a little hint of magic in this one too. I enjoyed the format of this book with the present day storyline interspersed with sections from different times in Grace’s life. Throughout the book she is given advice, often about her love-life, by Remy. Remy’s advice isn’t very specific, just guidance really, and Grace often misinterprets the advice. Remy is rather an unusual character, always proved right in the end, but I won’t say more than that! The reader can tell what Remy means but Grace just doesn’t always quite get it. We get to follow Grace’s relationships with the men in her life: first love Danny, a bit of a ladies’ man but a good guy really, Charlie her best friend since her teenage years and her husband Simon. I particularly enjoyed the parts of the book set in the 80s as they brought back memories of my own teenage years. This was a charming and really enjoyable story, full of romance, showing that help and advice can come in the most unexpected form – a perfect summer read. Love the sound of this novel and need to add to my wishlist. I wish I could spend my summers in Sandybridge hahaha By the look of the cover, it looks dreamy!